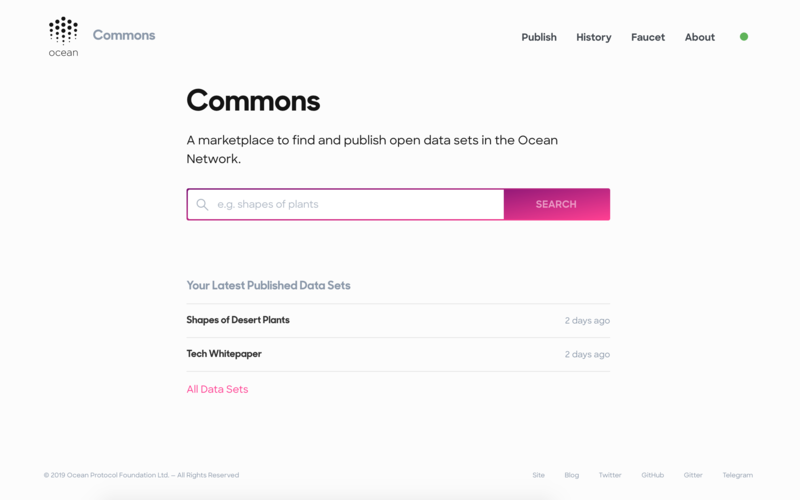 GitHub - oceanprotocol/commons: ⛲️ Commons Marketplace client & server to explore, download, and publish open data sets in the Ocean Network. Want to be notified of new releases in oceanprotocol/commons? This marketplace is deployed under commons.oceanprotocol.com and can be used there. Feel free to report any issues you encounter. If you're a developer and want to contribute to, or want to utilize this marketplace's code in your projects, then keep on reading. server: Node.js app, utilizing Express. The server provides various microservices, like remote file checking. Open http://localhost:3000 to view the client in the browser. The page will reload if you make edits to files in either ./client or ./server. To make use of all the functionality, you need to connect to the Ocean network. By default, the client will connect to Ocean components running within Ocean's Nile test network remotely. Modify ./client/src/config.ts to use those local connections. Test suite is setup with Jest and react-testing-library. For local development, you can start the test runners for client & server in a watch mode. Builds the client for production to the ./client/build folder, and the server into the ./server/dist folder. By creating the Git tag with these tasks, Travis will trigger a new Kubernetes deployment automatically aftr a successful tag build. Copyright 2018 Ocean Protocol Foundation Ltd.